Compostable packaging - Snact works to reduce packaging waste, too. We’ve partnered with TIPA and Parkside Flexibles to make sure our packaging matches our values: fighting waste with delicious snacks. We’re proud that our snacks are packed in plastic free home compostable packaging. The innovative film is just as durable and impermeable as ordinary plastic packaging, but unlike other commonly used materials on the market, it biologically decomposes in a home composter (an ordinary compost heap or your local council’s food waste collection) and returns to the natural cycle, behaving just like an orange or banana peel. Below are answers to some of the most popular questions about our packaging, but if yours isn’t answered, drop us a line at hello@snact.co.uk. 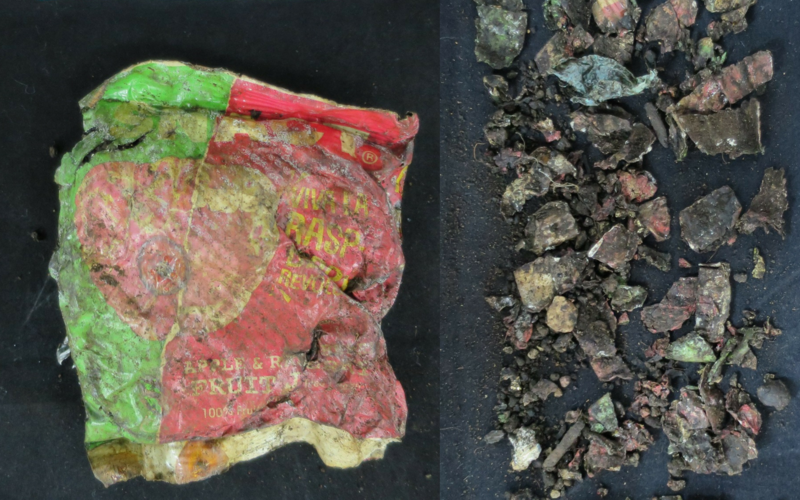 What happens to conventional flexible plastic packaging after it's used? The majority of flexible plastics are made up of different material layers that are attached together and therefore cannot be recycled; instead, they end up in incineration centers or remaining in landfills for hundreds of years. What's the difference between biodegradable and compostable? A material that is biodegradable will be broken down by biological processes. For a material to be certified as compostable, it must go a step further: a compostable material must break down, under the proper composting conditions, and the resulting elements will have value as a fertilizer. Only materials that are compostable are able to safely enter composting facilities. Our materials are certified 100% compostable. What is the compostable packaging made of? The packaging is made of a blend of different compostable polymers. The plant based source of some of these polymers is wood pulp and corn. What does the packaging break down into? Our packaging breaks down into compost, which can be used as a fertiliser. It means that eventually it is something bacteria can eat. What are the benefits of flexible packaging being compostable? As opposed to conventional plastic, compostable packaging can be organically recycled, while also producing valuable fertilizer. When compostable packaging is organically recycled, materials have been saved from ending up in a landfill, and a closed loop has been created that turns waste into a valuable resource that can benefit the soil. What exactly are "home composting conditions"? Unlike industrial composting facilities (temp 55 to 60°C, EN13432), home composting conditions refer to conditions where products compost at lower temperatures, so they can go into any ordinary compost heap at home.​ The temperature in a garden compost heap is clearly lower and less constant than in an industrial composting environment.​ ​This is why composting in the garden is usually a more difficult, slower-paced process. What happens if the packaging is thrown in a regular bin? If the packaging is thrown into a regular waste bin, it will go through the local waste stream where it's likely to enter a landfill or an anaerobic digester. If landfilled, the packaging will break down, though it will take longer than it would in a composter. In places with proper waste sorting, the packages could end up in an industrial composter, where it will break down along with the other organic waste. What happens if the packaging ends up on the ground or in the street? ​P​ackaging should not become litter​ in any case. ​Our ​packages are only designed to break down in composting conditions. If the packaging ends up on the ground or in the street in an urban environment, it will likely get picked up by waste collection and end up going through the same process as if it was thrown in a regular bin. If the packaging ends up in nature, it will eventually break down, although it will take much longer than in composter conditions.